the Mimi Switch: measuring facial expressions with just a set of headphones! The device looks like a normal set of headphones but is fitted with a set of infrared sensors that measure tiny movements inside the ear that result from different facial expressions. The gizmo — called the “Mimi Switch” or “Ear Switch” — is connected to a micro-computer that can control electronic devices, essentially making it a hands-free remote control for anything. 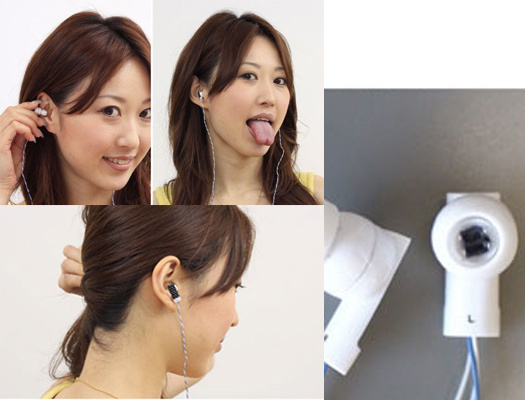 “You will be able to turn on room lights or swing your washing machine into action with a quick twitch of your mouth,” said its inventor, Kazuhiro Taniguchi of Osaka University. “An iPod can start or stop music when the wearer sticks his tongue out, like in the famous Einstein picture. If he opens his eyes wide, the machine skips to the next tune. A wink with the right eye makes it go back. The Mimi Switch could also store and interpret data and get to know its user, said Taniguchi, chief researcher at Osaka University’s Graduate School of Engineering Science in western Japan. Measuring emotions with Mimi Switch? As many of you may know, Paul Ekman distinguished 6 basic emotions that could be recognized through someone’s facial expression: anger, disgust, fear, happiness, sadness and surprise. Later he expanded his list with: amusement, contempt, contentment, embarrassment, excitement, guilt, pride, relief, satisfaction, sensory pleasure and shame. This instrument, which is being distributed by Noldus, measures the 6 basic emotions of Ekman with a camera pointed at someone’s face and software that has been developed by a Dutch company. I have seen it in action a couple of times and it is pretty nice. Nevertheless, the problem is that it demands a certain lab setting as the quality of the reading is quickly distorted by light changes, etc. Now, I was thinking, if the Mimi Switch is really able to measure these natural movements in our facial muscles and we know that many of those movements are a bodily expression of an emotion… could we perhaps programm the Mimi Switch to recognize emotions? It would have so many benefits, as we do not need any lab setting anymore to measure these emotions. We could place people in their natural environment and confront them with a product, situation or whatever, and register each and every emotionthey experience (as long as they can be measured through facial expressions). In that case, the Mimi Switch would not only make our lives easier as a ‘remote control’, but also for us researchers who like to measure emotions and experience in the most natural way.